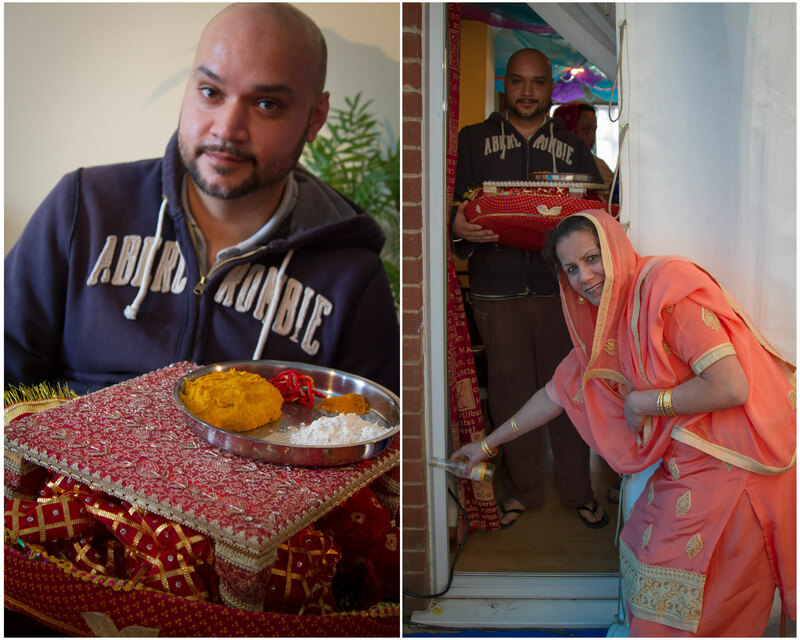 The second part of the wedding celebrations that I photographed for Sandeep and his family was the Maiya Ceremony, held the day after the Sangeet and traditionally to be held before midday. To start a rangoli design is made in the garden of the wedding home. This design incorporates rangoli (coloured powder), flour and rice. This is usually done by relatives from the boy or girl’s maternal family and in this case the design was created by Sandeep’s Mother and the ladies of his family, although there is no strict rule to this. A peeri (stool) is placed beside the design. This is where the boy or girl will sit and this should be east-facing. The boy or girl are brought out to where the rangoli design has been made carrying a thaal (tray), which has vatna (mixture of turmeric powder, flour and mustard oil that is kneaded into a moist dough-like consistency), a fatti (traditionally a rectangular piece of wood), gaaney (auspicious red thread) and dupatta (Asian scarf). They are sat down on the peeri, the fatti is placed under their feet so it is adjacent to the rangoli design. The dupatta is held above them by four people from each corner. The mother or any other elder in the family, wipe mustard oil on the boy or girl’s head with a few grass strands. Originally, the oil was applied to the entire hair, which has excellent conditioning properties. Over generations this has reduced to a few dabs on the forehead leaving them looking greasy until the wedding morning, which is when they could wash their hair! Family and friends then begin rubbing the vatna on the boy or girl. This is concentrated on the face, arms, hands and feet. The maiya ceremony is a playful and cheeky affair when relatives will often mischievously apply the vatna on every available body part! Ladies traditionally sing jovial folk songs to enhance the celebratory atmosphere. Once everyone has taken it in turns to rub the vatna; the mother attempts to feed a rice and sugar mixture to the boy or girl. Their sister-in-law (brother’s wife) playfully tries to stop the mother from doing this by smacking the mother’s hand away. This is another feature of the comical nature of the maiya ceremony. Meanwhile, all guests are given a gaana (auspicious red thread), which they tie around their wrist. Designs can vary and people tend to be creative with bells and beads to accentuate the gaana. 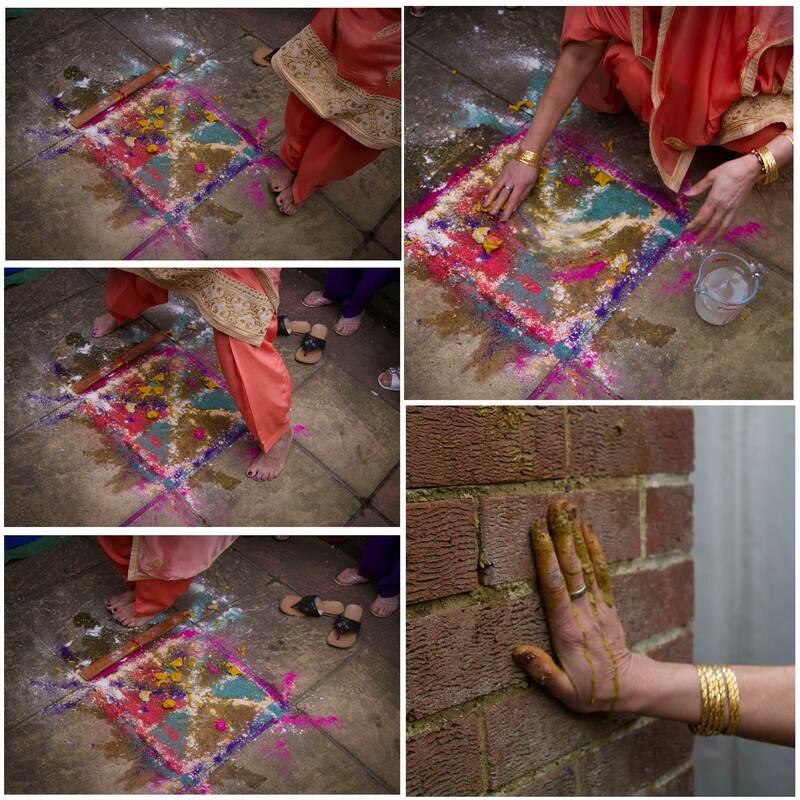 The boy or girl’s mother then clears the rangoli. Before she does this, she steps over the design either side seven times, then uses water to collect the rangoli to bring it to a paste. This is thrown over the house or on a rooftop for birds to feed from it. This is also considered auspicious. She will then leave three handprints on the house, because her hands would be stained after clearing the rangoli. This was traditionally done on the front of houses in India as a sign that it is a wedding house. Once the Maiya ceremony has been done two days prior to the wedding day, the boy and girl are generally refrained from leaving the house (although this tradition is largely ignored now). The main reason behind this is to ensure the security and safety of the bride or groom-to-be. They are told not to bathe or change their clothes until the wedding morning, which probably sounds repulsive! But the rationale behind it is quite the opposite. The clothes aren’t changed because otherwise they would be stained with turmeric. The vatna is a natural skin purifier so acts like a face and body mask. This is why it is applied three times before the wedding day. 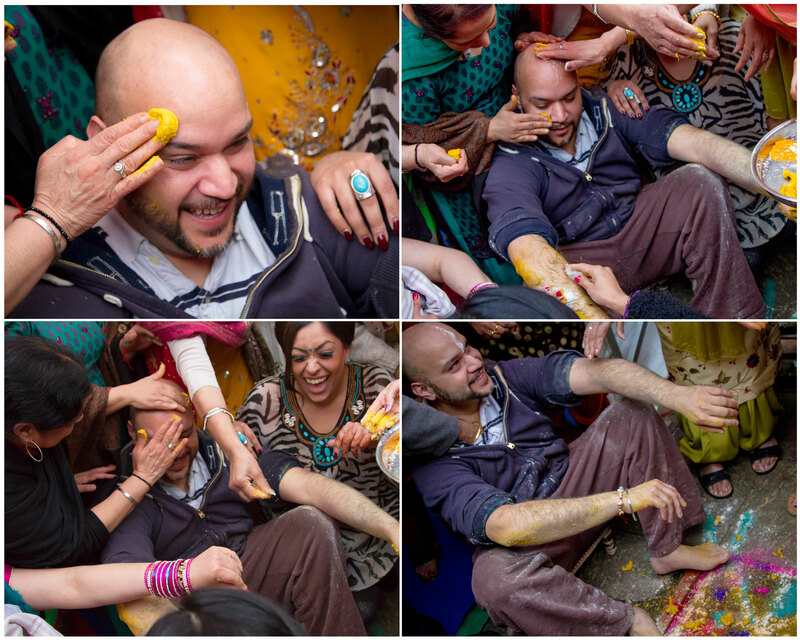 So the main purpose behind the maiya ceremony is to beautify the couple! Although traditionally the Sangeet night is also the Mehndi night the Mehndi was done in the afternoon of Sandeep’s Maiya ceremony with some amazing designs. I would have loved to be a part of the whole wedding to have had the opportunity to photograph the ceremony and celebrations after the ceremony as well but I was already booked to head to Huddersfield for the wedding of Vikky & Woody on the Saturday. I’m really looking forward to my next Indian Wedding.